Wimmer RS has revealed their new tuning program for the Ferrari F430 which has been developed for the 2009 Essen Motor Show and features more power and unique appearance. The 483hp engine in this Ferrari is upgraded with a new management software and a handbuilt high grade steel exhaust system that optimizes dynamic pressure contains two welded high grade steel exhaust manifolds as well as two sport catalytic converters and an exhaust valves control unit. The driver can change the noise of this system electronically. These changes are good for an extra 38 hp, which bumps the car’s top speed up to 321 km/h, 11km.h more than the standard. 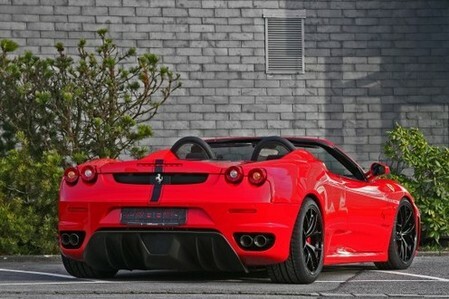 For acceleration up to 100 km/h F430 Scuderia needs now just 3.84 seconds. 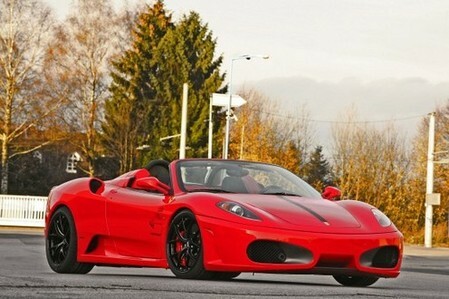 200 kph speed is reached within 11.03 seconds and 300 kph – within 34.9 seconds. Wimmer has also installed KW HLS system (Hydraulic Lift System) and ultra light weight BBS FI wheels (8.75×19 with 225/35 R 19 on the front axle and 11.25×19 with 305/30 R19 tyres on the rear axle) with Dunlop high performance tires.